Style: Short and sweet; Audience; Getting and keeping a job: Letters of recommendation, cover letters, résumés, self-assessments, thank-you notes; Meetings and reports: Minutes, formal reports, progress reports, annual reports, project proposals; Managing: Performance reviews, employee documentation, job descriptions, search committee reports, budget requests; Public services and collections: Subject guides (pathfinders), collection assessments and other documents related to collection development, memos or letters to faculty about the library collection, external reviews, marketing tools (bookmarks, brochures and posters); Online and presenting data: Writing for the website, blogging, e-mail, tables, graphs, charts; Scholarly work and teaching: Articles, abstracts, case studies, syllabi, handouts; More resources for writing. Mastering the skills necessary for clear, effective writing can make writing tasks flow more easily. 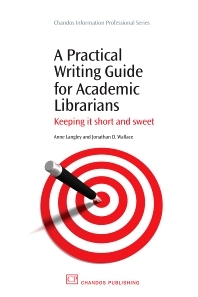 This book helps academic librarians who are new to the profession or new to a supervisory or management position, as well as those who want to be more productive and make the their writing for work go more smoothly. From progress reports to project plans, cover letters to case studies and book reviews to blogging, readers will find examples and how-tos for most of the types of writing they need to do in their academic library careers. Anne Langley is Co-ordinator of the Science and Engineering Libraries and Head of the Chemistry Library at Duke University, USA and has worked in academic libraries for over 18 years. Jonathan Wallace has been a newspaper copy editor, writing tutor and freelance academic editor for 17 years. He is Nation and World Editor at The News & Observer in Raleigh, N.C., USA.